Logan Sports Marketing provided end-to-end event management for a gala fundraising dinner hosted by GE, to raise money for Help for Heroes. In January 2015, GE adopted Help for Heroes as its very first National Fundraising Charity Partner, pledging to raise £350,000 for a new Wellbeing Suite at the Catterick Recovery Centre in North Yorkshire. LSM were brought in with the objective of delivering the largest event of this two-year partnership and worked with GE to create a dinner and auction for 190 people at OXO2 in London. In order to both entertain GE staff and their customers and clients, and also raise awareness of the partnership and fundraising requirements, LSM worked with GE to produce and informative and engaging event. In keeping with a Brazilian theme to honour GE’s sponsorship of the Olympic Games 2016, samba dancers entertained guests during the drinks reception and a Q&A was held during dinner, featuring Para-athletes Alex Krol (Wheelchair gold, Invictus Games 2016) and Anna Turney (double Winter Paralympic Skier) and Help for Heroes Ambassadors, Scott Meenagh and Gemma Morgan, who have both been helped by the charity. 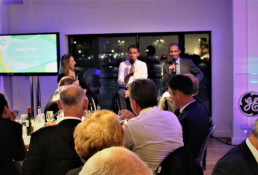 The evening was hosted by BBC sports broadcaster, Andrew Cotter. The auction was conducted by the inimitable Russ Williams, with items all donated by fellow GE employees or by Help for Heroes and raised a significant amount for the charity.